Good Morning! Today's Twisted Tuesday challenge is a theme challenge. We were to create a refreshing creation and the twist is that we had to use red somewhere on our cards. I have to admit that this card took me some time to make. I used my big shot a lot on this card. I began by stamping the ice cream scoops and cutting them out. I stacked them onto my punched cone and then I added a cherry using the create a cupcake builder punch. I punched out the cherry using white card stock and then I colored it using markers. 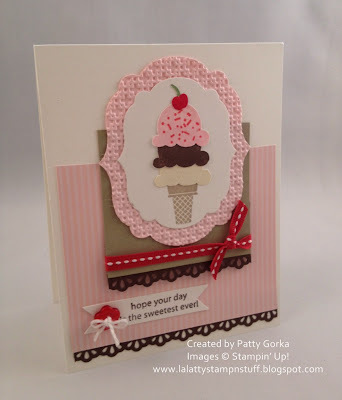 My pretty in pink layer was cut using the labels collection framelits and then it was dry embossed using the square lattice folder. I used the new finishing touches edgelits to cut out my chocolate chip card stock borders. My sentiment was stamped and then cut out using the new bitty banners framelits and I decided to add (next to my sentiment) a red button with some twine tied through it. I hope you'll be able to play along with this week's challenge. If you would like to see the other design team member's cards I'll post their blogs here for you. Have a wonderful day! A great big thank you for taking the time to stop on by! This is so charming!! What a wonderful color combo to start with paired with just a delightful design - beautiful!! This is so charming!! What a delightful color combination paired with such a beautiful design - this is quite lovely!! Darn Cute--just want to enjoy it in person! This is scrumptious!!! LOVE all the uses for the cupcake builder punch! That punch and the postage punch are next on my list!!! :) LOVE this!!! Very sweet and fun card. The details are just perfect. Great job! I love everything about this card. The color, layout, embellishments...everything is just perfect. And, it looks so yummy.